Where do I begin, well I suppose it would be back in October 1983, the very first time I recorded a fight onto video. It was on a Lloytron I recorded Jim Watt v Charlie Nash, when the BBC screened it on there one hundred greatest sporting moments programme back in 1986, it proved a huge mistake as the tape when played back had glitches and the picture wasn't as clear for obvious reasons, you pay for what you get.....simple as!!!!! Another Lloytron was used this time for the historic Honeyghan v Curry fight, I recorded this one in extra play, OUCH!!!! as you've guessed, it was not a good idea! I soon started to get a half decent sized collection together, taping from terrestrial TV, the likes of ITV Saturday afternoon shows, that would run for around two hours, live fights, plus also recordings of fights from around the globe, usually America, these were hosted by Dickie Davies the mustached well spoken English gentleman, they were the days hey!!!!! Reg Gutteridge provided commentary's for ITV as did Harry Carpenter for the BBC, I loved also to listen to the radio commentary's on the radio, and have taped a few of these myself. My collection grew and grew, I'd tape any boxing from programme like Midweek Sports Special, Sportsnight, Grandstand, which on a Saturday back in 1987 showed the grandstand prospects of that particular year, Mickey Hughes v Kelvin Mortimer in there first meeting, to Michael Watson v Cliff Gilpin, Watson boxing in Adidas trunks at the York Hall, that was a sight, Gilpin best known for his two epic fights with Lloyd Honeyghan, the first strangely only shown in highlights, and not complete as was there second contest, the first fight being one of the best fights you'll possibly ever see for the Lonsdale belt, also a fight Lloyd Honeyghan says was the hardest of his career. Itv soon started to televise there own shows featuring prospects, on primarily Frank Warren shows, in the series Seconds Out! A show that featured mainly the likes of the Collins brothers from Yately, George and Tony, plus Nigel Benn as he climbed the ladder to a Commonwealth title, also being able to see the late James Oyebola the tallest man to become British heavyweight champion in quite a few fights on those shows, also an intermission in the show was neutral corner that had a famous fighter or boxing personality being interviewed, I taped all of these barring one or two, and rarely missed one. 1987 saw ITV begin to show live boxing from America in the small hours, though on Central television they showed Tyson taking Trevor Berbick's title the year previously, plus his future fights versus mssr's Bonecrusher Smith, and Pinklon Thomas, these were shown in the north of England as they happened, in the south we had to set the alarm clock for 9 am on a Sunday morning to see Mike on his way to unifying the heavyweight championship, getting back to the ITV Saturday afternoon shows, they would sometimes show under card fights also from big American shows, like Tyrell Biggs v David Bey from Tyson v Smith show and Matthew Hilton v Franklin Owens from Tyson v Berbick, for example also I'll never forget the time on a Saturday afternoon when Rocky Kelly after beating Tony Brown slipped up when he said "I had to show him who the F****** guvnor was" then realising what he had just said on live tv, he kept apologizing! Funnily enough ITV did show Mike's next fight versus Tyrell Biggs live in the south of England, this being the first time that they showed live boxing in the southern part of England from America in the early hours, soon afterwards followed Thomas Hearns v Juan Domingo Roldan, a classic that enabled Hearns to create history in becoming the first boxer to win an unprecedented fourth World title in as many weight categories, although Hearns demolition of Britain's Dennis Andries was indeed shown live from America, it was in the evening time in England, then again Alan Minter's fight versus Mustafa Hamsho was also shown live from America.. I taped as many as possible and only missed five fights from the entire year, I also had a healthy habit of recording fights from the opening credits to the finish credits. Thing is when recording onto vhs tapes, one thing you must remember is organisation, to label tapes with the fights on them, so you know whats on what and it saves time spinning tapes back and forth to find whats on them. Im currently in the process of recording around two hundred possibly more three hour tapes full of boxing onto DVDS, an unenviable task surely. But it's got to be done, I have several thousand fights on film, and have thus far converted to five hundred DVDS fights from VHS, so yes as I taped them in sp mode of 2 hours, I have around a thousand hours footage, plus as I've mentioned before a couple more hundred tapes yet to put onto Disc, Im not looking forward to the electricity bill I can tell you. I was told recently that DVD's have a life span of only ten years, and they don't last up to a lifetime as we are lead to believe!!!! Naturally time will tell me about whether that is a myth or just simple fact, I don't particularly cherish the thought of having recorded literally thousands of fights onto a mountain of plastic discs only for them to fail me miserably in a lifetimes time, only to be led to believe they would indeed last me a life time. I also in late 1986 bought the series of ABC tapes that were of six in total, that covered the heavyweights to the best fights of Sugar Ray Robinson to Ali, to the light welters, these were distributed in nice cases, and at the bottom of the inlay sleeve was some impressive artwork of former great champions in a portrait style on a old fashioned championship belt, the series was awesome, and came out at the right time, as VHS went on sale to the general public in 1986!! 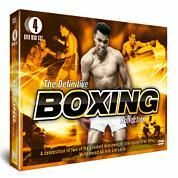 Some of the first tapes that came out were Barry Mcguigan v Eusebio Pedroza, that the BBC released shortly after the Danilo Cabrera title defense, I purchased this very tape for the huge sum of twenty quid for a 60 minute tape! They all followed soon after Muhammad Ali aka Cassius Clay the Warner bros big box a nice piece to have in one's collection, Ali v Foreman now such a wide release, how many times do I see this at the boot sales I frequent on a regular basis! But in all seriousness you couldn't get this fight any where for love nor money before 1988, all I could do was see it on one of the aforementioned ABC tapes, and all that was, were just photographs from the fight, not even film, I gathered the producer at the time never acquired the rights to show any film of the fight, so when it was released to the general public in the summer of 1988, I bought it for my eighteenth birthday, I know I'm old! More tapes were aquired by myself British World champions, featuring Minter v Antuofermo 2, Conteh v Ahumadha, Watt v Pitulua, Howard Winstone v Siki, Mo Hope v Rocky Matioli 1 amongst others, talking of Mo Hope or should that be no hope, as there was'nt any chance these British masterpieces were to be released in the entirety, we had to put up with edited highlights all in either glorious technicolor or obviously at the time black and white, also a video serving as a tribute to Henry Cooper, I found it hard how they could call it a tribute as both fights were losses to Muhammad Ali and Joe Bugner, also yep you guessed it they were edited highlights also, I mean why not show Cooper beating the likes of Jack Bodell, Billy Walker, Joe Erskine, Jose Urtain the Spanish rock lifter, talk about heavy weights.